After a bitter cold week here in North Central Pennsylvania things finally started to warm up yesterday. I think it’s almost time to start picking up some plants! In fact, my Mom and I have a little trip planned to visit this amazing greenhouse tomorrow. So excited! 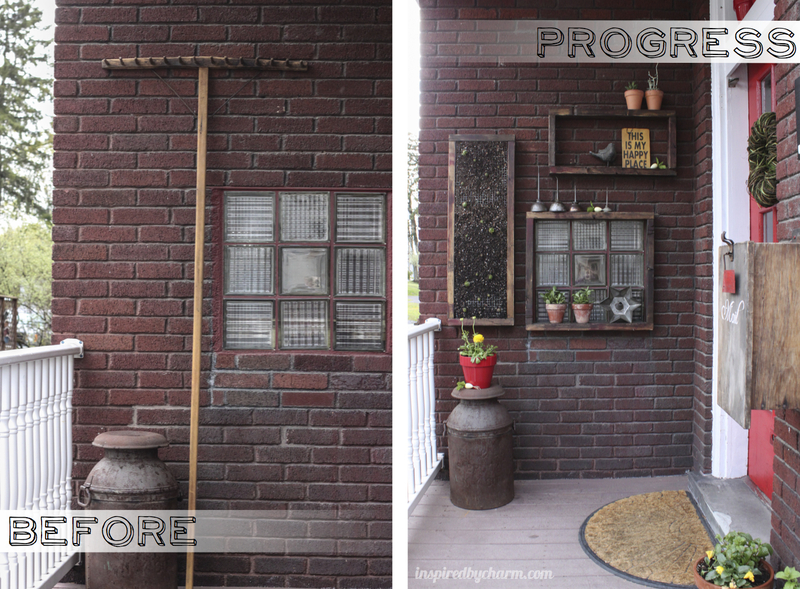 Yesterday I made a little more progress on my Outdoor Shelves. I hinted that this was going to be happening in my last post and a few of you easily picked up on my plans. I now am officially the owner and creator of my first vertical garden! Ta da! I do realized I need a lot more hens and chicks, but I picked up this little bunch at my brother’s house yesterday and just couldn’t wait to get started. I have a few leads on some more, so this sucker will be full in no time, plus I want to leave a little room for things to grow. 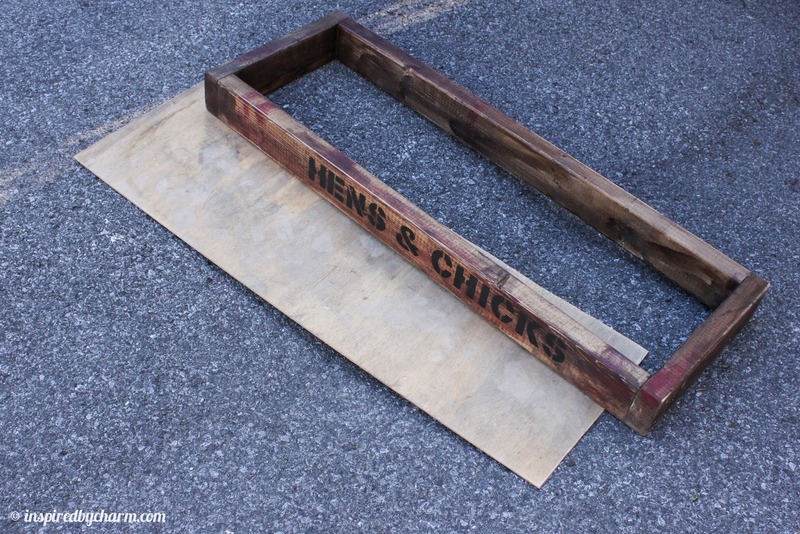 The first step to making my framed hens and chicks was to cut a back for my frame. I traced my frame onto an old piece of paneling I had on hand, then cut it out using a circular saw. After that I sanded down any rough edges. I picked up some hardware cloth (wire screen) at the local hardware store. Using my newly cut back as guide I cut out the cloth it leaving a little extra on each side as I will be stapling this to my frame. I trimmed off the excess on each corner to to give me a nice clean edge when inserting it into the frame. I folded the hardware cloth to neatly fit into my frame and then slide it into place. Using a staple gun, I secured it to the frame. Once all the staples were in and the screen was secure, I was ready for dirt. I did purchase one new bag of soil designed for succulents and cactus as the first layer. I filled in the rest with soil I had from an old flower pot. I packed the soil in as much as I could to make sure it would stay in place. Once the frame was well packed with dirt and any excess was removed from the frame. I applied the back with wood screws. When I flipped the frame over I honestly expected lots of dirt to fall out, but was pleasantly surprised to see that mostly all of it stayed inside the frame. Next up, planting! I was going to go with a mix of succulents for this frame, but ultimately decided to stick with just hens and chicks as they can stay outside all winter. I dug these guys out of my brother’s driveway. Some of them already have little baby chicks growing out of them! Too cute. To plant, I used a wooden skewer. I first inserted it through the grid and then wiggled it around to form a hole. Then, I placed the roots of the plant in the hole. If the roots were large I used the skewer to force them down. 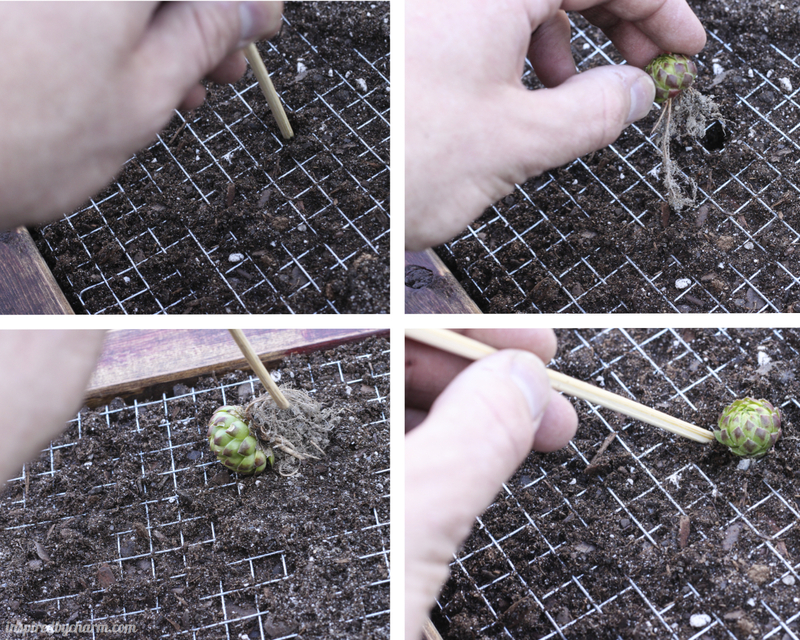 Once the plant was in place, I inserted the skewer into the holes around it to fill the dirt back in. 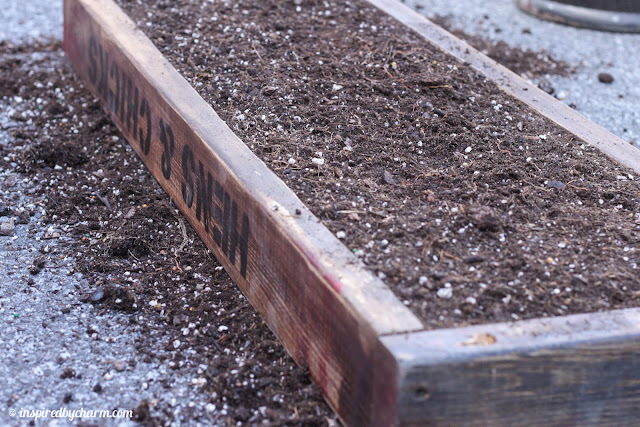 The process was a little tedious, but I love planting, so I enjoyed every minute of it! After that, I was done (for now), and back to the wall the shelf framed hens and chicks went. Its been hanging for about 24 hours now and everything is still in place. Success! I also temporarily added a couple other succulents to the little pots on the shelves (I bought these before I made the decision to stick with just hens and chicks). They most likely won’t stay there, but I’m desperate for a little more green! Over the next week or two I finish up the styling of these little shelves and share the completed look with you then. I’m also hoping to dig up a few more hens and chicks too, unless these guys plan on multiplying over night. 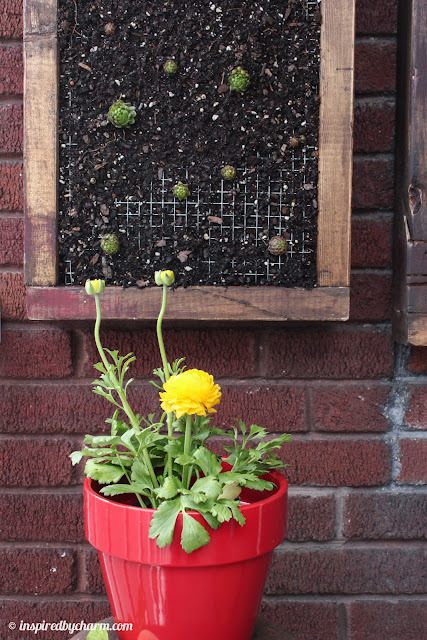 So, what do you think of my new vertical garden? I LOVE this so much, and I don’t just love it, I covet it! I want one of my own!!! So cool, great idea! It looks so cute out there! You are a DIY genius! Michael I love it! 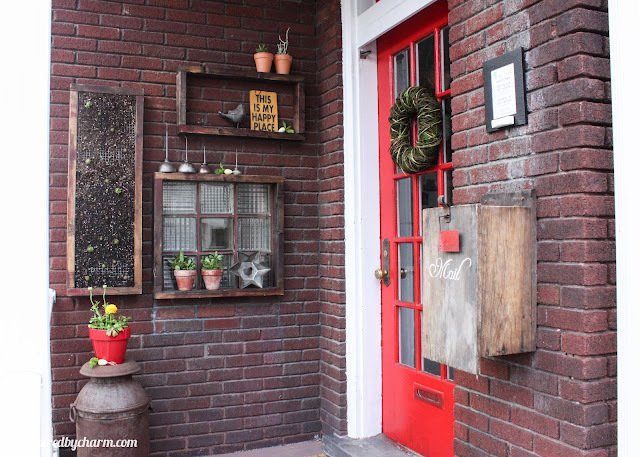 I love the rustic look of the whole wall. I have one question… Do you have to worry about the dirt coming out when it rains? I’d love to try this idea. I just love this idea. 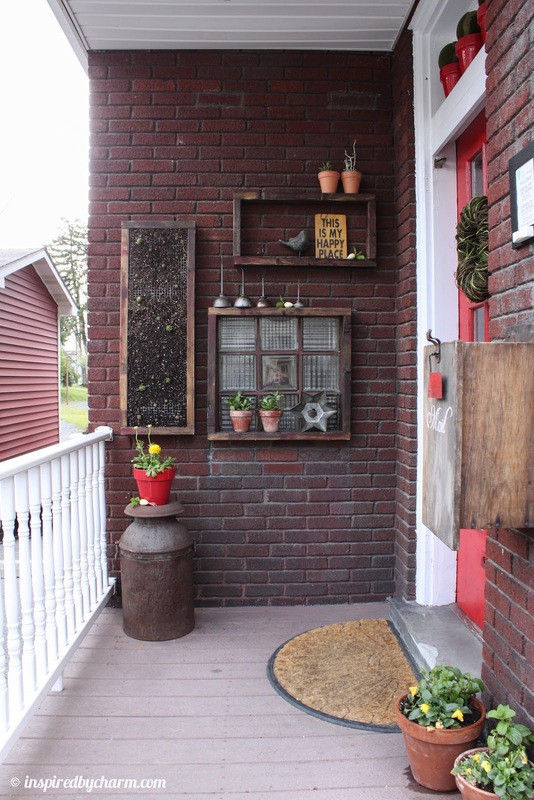 I would love to do this in my entry way but I have wooden siding and live in the Great Northwest so would this be feasible Do you think? Wow…so impressed! I love the framed window, and want to try your “vertical garden”, it is going to be fabulous. The whole porch looks so welcoming! It is nice to see the pulled back view of the area, looks even better when you can see the whole porch area. Do you have any idea how to water them? I can’t wait to see it blossom. Its a beauty. I LOVE it! But how do you water it? Does the frame have to come down each time? do get one larger plant to pull totally apart there you have your multiplication. plant in all the little leaves and watch them grow and fill out your planter frame. I have also want to do this but I will use different species to mix together thus create a growing image. Amazing how you did that. I thought for sure it would fall out too. Good for you! What happens when you water it? Will it drip down the wall? Or do you just mist it? It is so cool and think it is the coolest project I’ve seen! I also wonder how you water it, can it be put on hinges so you only have to put it in a vertical position and water it? 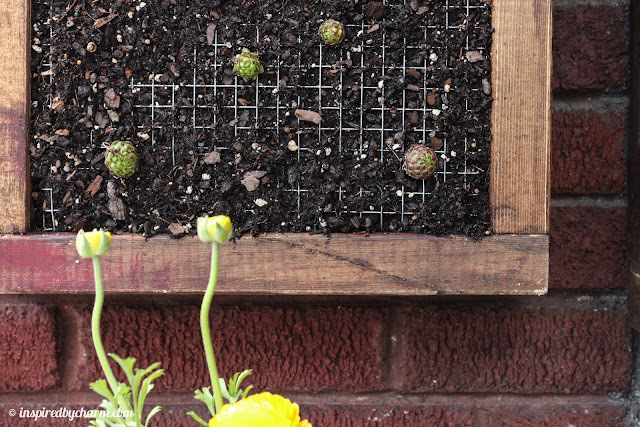 I love it, but i probably wont do it for hens & chicks as some years we have bitter winds here and things freeze rock solid, i am thinking maybe some thing else…. It looks lovely Michael! I love these vertical succulent displays but yours takes the cake for perfection! The porch looks so welcoming, bravo! Lovely succulents, Michael! I’ve been stalking you on pinterest for quite sometime; but I only just made it over to your awesome blog. Keep on with your awesome self! This is very cool, Michael! Love the scale of the piece. Dad and I made this over the weekend and I gave it to mom for mother’s day. She loved it so much and we had fun making it! 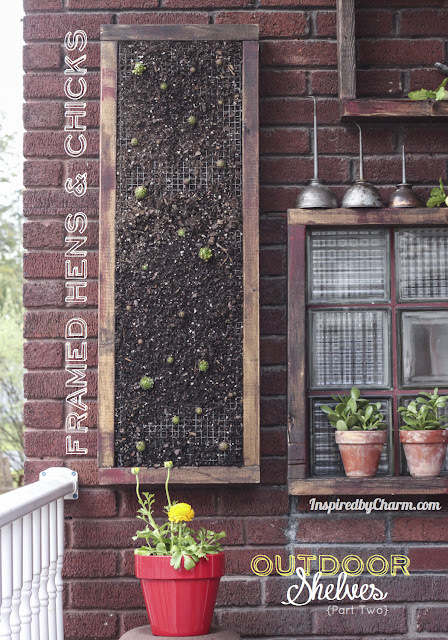 I used an old window frame and a pit of hens&chicks. 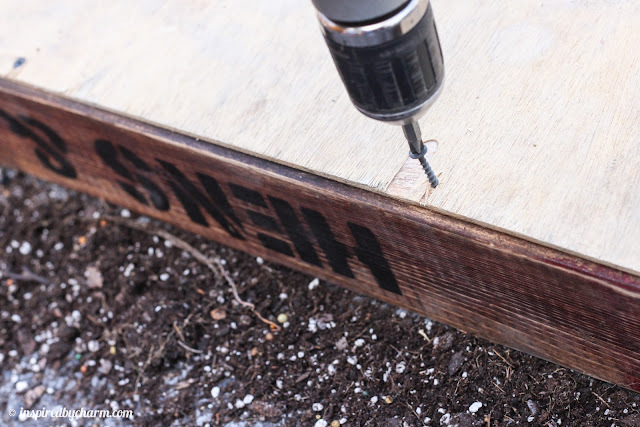 Thanks for the creative idea and detailed instructions… I love your blog! Do you just spray them with a water bottle? I know now what my daughters getting for her birthday. Thankyou!! Very cool Michael – found out about you via Brooklyn Limestone. I have to try making one of these verticals! I love them. Check out my blog – I reported on the San Francisco Decorators Showcase which had a huge vertical wall of succulents. As you are walking to the front door of the house,you are greeted with a long and gorgeous vertical garden. It’s stunning!! Wow…what a great idea for vertical space and easy to care plant…we’re do the babies go, for more growth? Shut the flip up! That is more than cute! Very very clever! 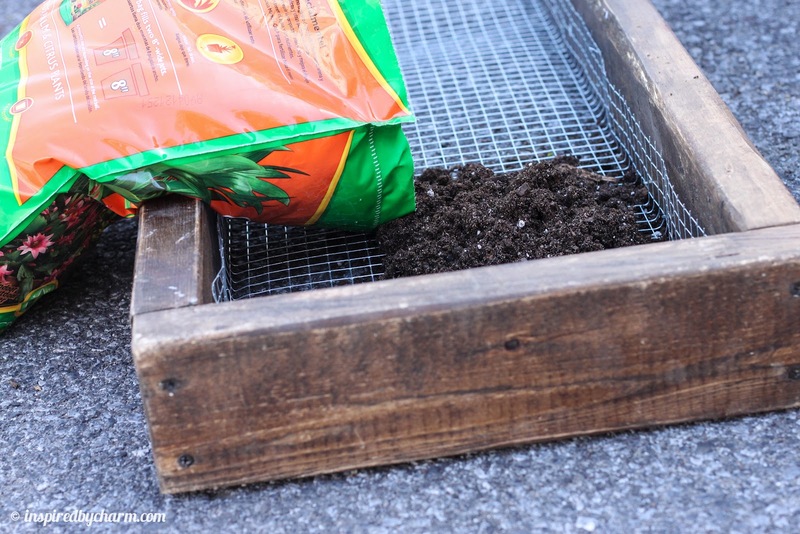 I love this idea and project, my only question for you is how do you intend to keep the soil from packing/settling and falling out of the frame when watering the plants? Otherwise great idea and concept..
Reading your description of your process shows your gentlity and kindness. I am in the process of making my own vertical succulent garden, so have been looking at a variety of posts showing other people’s work. Just reading how you express yourself made your blog, and you as a result, standout. Your mother hen was lucky to have you as a ‘chick!’ The world needs men like you. You’re too kind Yvonne. 🙂 Thank you! Absolutely love this! On my way to gather some wood scraps! would love to see an updated photo of this !! !